The 25th Annual Enfield Rotary Classic Girls' Basketball Tournament Dec. 28-29 featured two nights of fierce competition between teams from Enfield, Ridgefield, Hartford (Weaver HS) and West Hartford (William H. Hall HS). Fans were treated to hard-fought final games, both of which went into overtime. In the consolation game Friday night, Ridgefield defeated Weaver for third place. In the final, Hall outlasted Enfield and notched an overtime victory for first place honors. Congratulations to all of the players, coaches, managers, families and supporters who contributed to another memorable Rotary Classic Tournament. 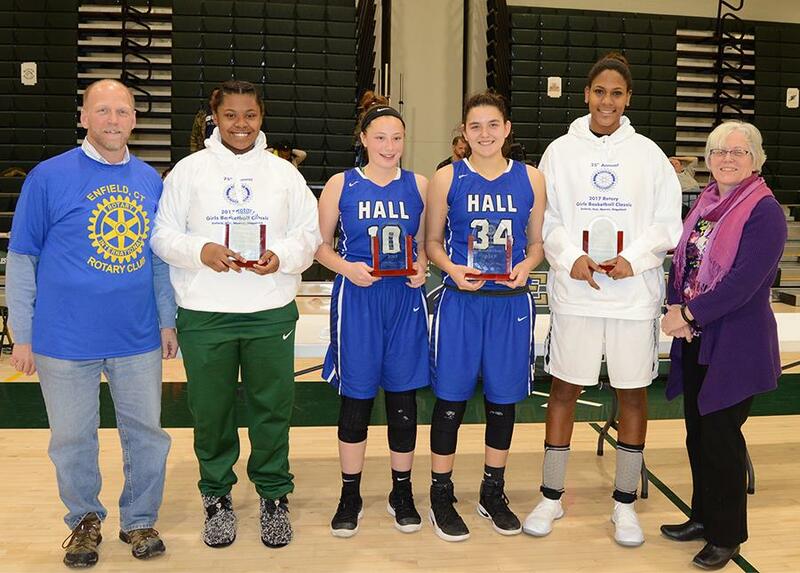 Tournament Chair Scott Kaupin and club President Carol Bohnet present the 2017 All-Tournament Team (l-r) Pashan Walker from Weaver HS; Lexi Gellerman and Olivia Bonee from Hall HS; and Mary Baskerville from Enfield HS. Olivia Bonee was named the Tournament's Most Valuable Player. Missing from photo is Caroline Curnal from Ridgefield HS.